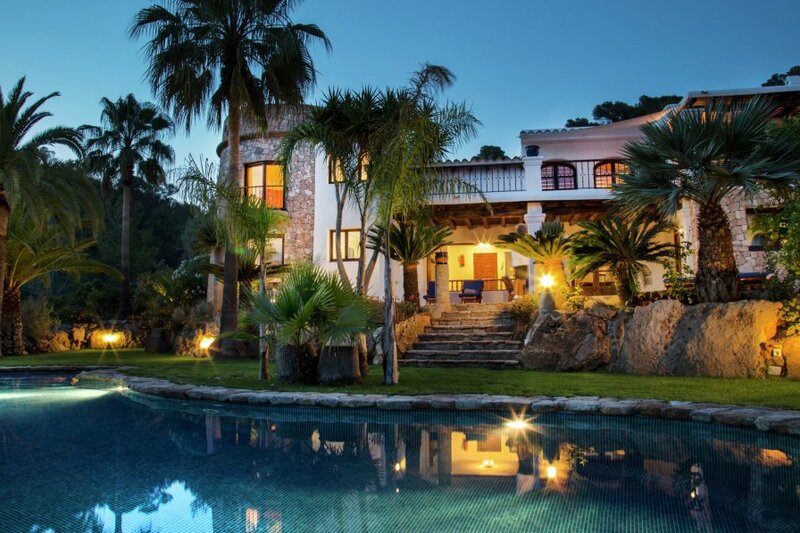 This spacious, luxurious villa has been built in the traditional architecture of the Island and is peacefully situated on top of a hill, just outside Santa Eulalia (2 km. ), 15 km. from Ibiza Town. The property has impressive views over the hills and Ibiza scenery, and has a luscious garden with palm trees and a fishpond. Santa Eulalia is the second largest town where you will find banks, supermarkets, a good morning produce market, a yacht harbour and the famous street of restaurants. The high ceiling living room, with comfortable sitting area, has an open fireplace, satellite television, music equipment, video and a beautiful covered terrace overlooking the pool area. There is a guest toilet here. Next to the living is the fully equipped kitchen with dishwasher, microwave, hot air oven and ceramic cooking plate, fridge/freezer, and glass doors leading onto the same terrace as the living room. There is a pantry with washing machine and dryer. Going up a small staircase, in the tower, there is a double bedroom with en suite bathroom with a jacuzzi. This room has a wooden floor and glass doors sliding open onto a balcony. Up one more small stairway is another double bedroom with en suite bathroom with jacuzzi. This room also has a wooden floor and a balcony, and beautiful views over the hills and pool area. On the other side of the house, going up a small flight of stairs is a stylish sitting area with large roof terrace, with the same wonderful views. Here are two twin bedrooms, both with glass sliding doors onto a terrace, sharing a shower room. All the bedrooms and the lilving room down stairs have air-conditioning. The large kidney-shaped pool, (12 x 6 m) has a sunbathing terrace with sun beds and parasols. Next to the pool area is an outside kitchen and barbecue area, with a four pit cooker, fridge, freezer, a teakwood dining table for eight people and a bathroom with shower room and a toilet.